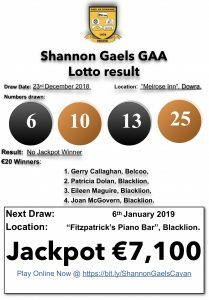 Club Lotto Result Update, Draw 23rd December 2018. 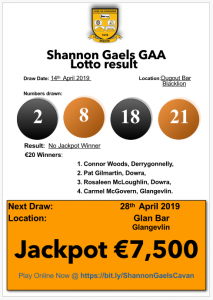 Lotto Draw Update, Draw 14th April 2019. Weekend Fixtures Phairc Gaeil Na Sionnáinne, Blacklion. Lotto draw update, draw 31st March 2019. Copyright © 2016 Shannon Gaels. All rights reserved.